He was born and brought up in Cambridge and attended Cambridge Grammar School before reading medicine at St Thomas’s Hospital. Whilst there he took an intercalated BSc in Neurosciences and won the Solly Medal and Prize for Surgery in his final year. 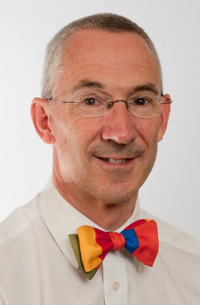 Neurosurgical training was in Bristol, Cambridge and Newcastle; where he gained the FRCS (Neurosurgery). This was followed by a specialist fellowship year in epilepsy surgery at The Austin Hospital, Melbourne, Australia. He was appointed Consultant Neurosurgeon atØ Queen’s Medical Centre Nottingham in 1995 where he remains to this day. He has also been a member of the Royal Naval Reserve since 1985 and served in the Gulf War in 2003 on board RFA Argus as neurosurgeon for the allied naval forces. He currently holds the rank of Surgeon Commander. He was training programme director for neurosurgery at Queen’s Medical Centre from 2003 to 2010, and has been on the panel of National Selectors into neurosurgical training since 2007. Since 2006 he has been an examiner for the FRCS Neurosurgery exam as well as a member of the question writing panel. He has set up and runs a hands-on neurosurgical course in cervical arthroplasty (artificial cervical discs) at Queens Medical Centre and also teaches on both the Royal College of Surgeons and Queens Medical Centre Neurosurgery courses.